Citation: C N Trueman "The Thousand Bomber Raid"
Bomber Command gained a new commander in February 1942 – Air Marshall Arthur ‘Bomber’ Harris. He believed that Bomber Command had yet to prove its true worth in the war and he was concerned that it was not being strategically fully utilised. Harris wanted this to change. Harris wanted Bomber Command to participate in a raid that used near enough all of its front line and reserve strength in a bombing raid against a German city that would be so devastating that the people of Germany would force their leaders to sue for peace. His idea was known as the ‘Thousand Plan’. Harris first discussed the plan with Air Vice-Marshall Saundby in May 1942. Saundby spent a few days checking on the figures and informed Harris that his 1000 bomber plan was just about feasible. In May 1942, Bomber Command comprised of 37 medium and heavy bomber squadrons (16 Wellington, 6 Halifax, 6 Lancaster, 5 Stirling, 2 Manchester and 2 Hampden). Assuming that at any one given time that some bombers would be out of service, this gave Harris about 400 serviceable bombers – well below his figure of 1000. If raids were suspended for 48 hours and the unserviceable planes were all serviced, this would increase the figure to 500. However, when the figure was added to Coastal Command – armed with Whitley, Hudson and Hampden bombers, the figure increased dramatically. If Harris also added on those bombers that were being replaced with the new Lancaster bombers, then he got near to his figure of 1000. 1000 planes in the air would make an easy target for anti-aircraft fire. Could Bomber Command sustain heavy casualties? The new Lancasters and other new bombers had modern navigational equipment on board – many of the old bombers did not. How could Bomber Command compensate for this? Just how acute could mid-air collisions be? Harris envisaged a raid lasting just one hour. Was it possible that 1000 planes could get to the target and drop their bombs in such a short time span? Such an attack clearly needed decent night time weather. Harris passed these problems over to the experts and expected them to find solutions to the problems. The scientists did just this – with one proviso. They estimated that there would be only one mid-air collision per hour if the raid was extended to 90 minutes and if the force had three separate targets to aim for within the city targeted with the flying heights of each force staggered. Buoyed by such news, Harris made an appointment to see his superior, Charles Portal, Chief of the British Air Staff, with his plan. To ensure that he had support for his plan, Harris also saw Winston Churchill who was enthusiastic. The only ‘dispute’ was over the intended target. Harris wanted Hamburg for its symbolic status; Churchill wanted Essen as the heart of Germany’s industrial might. However, scientists advised Harris that Essen was not a good target as the city was covered by an industrial haze even at night and bomb aiming might prove difficult. Those who worked at the Operational Research Section advised that Cologne would be the ideal target as it was reasonably near for the planes in terms of flying and as a major railway hub, its destruction could seriously damage Germany’s ability to move goods around in that area of Germany. It was decided that the target would be selected on the night of the raid and that the weather would be the determining factor. 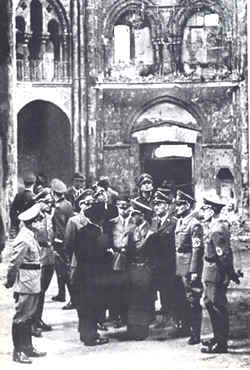 On May 20th 1942, Portal gave his support to the plan. This now allowed Harris to make concrete plans for the raid. Coastal Command and Fighter Command were given their requirements, the first to assist in the bombing (and air/sea rescues) and the second to attack known German night fighter bases. The raid was planned for the night of May 27th/28th. However, the Admiralty refused to allow Coastal Command to participate and the total number of bombers was suddenly reduced to 800. Harris made this up by using every bomber he could with pupil and instructor crews. Both Harris and Saundby had anticipated that the Admiralty might refuse to hand over the planes of Coastal Command – and had already planned for such an event. Though he had no wish to use inexperienced crews, Harris felt that he had no other option – and the inexperienced could only gain from the experience. Bomber took off at 22.30 from 53 bases across Britain. Crews were told to pick out the River Rhine, once flying over Western Europe, and use it to lead them into Cologne. The first bombers to arrive were the most modern equipped with GEE navigational equipment – Stirlings and Wellingtons from 1 and 3 Groups. They had a specific target and for 15 minutes they had that target to themselves – the Neumarkt in the city’s old town. The idea was to set it alight with incendiary bombs so that it acted as a beacon for the other bombers coming in. These planes would bomb areas one mile to the north or south of the Neumarkt. The men at Bomber Command’s meteorological office has been right. The bombers flew above cloud from Holland right to the German border – here it disappeared, as had been predicted. When the first bombers got to Cologne, the moon gave the crews near perfect visibility. Within 15 minutes of the first bombs landing, the old town was ablaze. However, for all the bombs dropped, Cologne was not destroyed. Industrial life around the city was paralysed for a week but within six months it had recovered. Of the 1,046 bombers that took part in the raid, 39 were lost – primarily to night fighters. This represented a loss of 4% which was considered the maximum Bomber Command could sustain.